Gokyo Valley Trekking commences from Lukla and then we continue the trek towards Namche through Dudhkoshi. As we venture up to the Dudhkoshi River and Namche bazzar, the scenery grow more spectacular. Namche Bazzar is a gateway of Mt Everest region, situated at the height of 3400m. Gokyo valley trek will have an opportunity to view Amadablam, Mt. Everest and Lhotse. We pass through other villages like Khumbu, Khunde and Khumjung. After reaching Khumjung valley, we split from the main busy trail towards the quiet village of Phortse Tenga and finally you will find yourself at our destination Gokyo. While doing non-technical climb of Gokyo Peak, you will see truly a magnificent and panoramic view of Mt. Everest and other beautiful mountains. 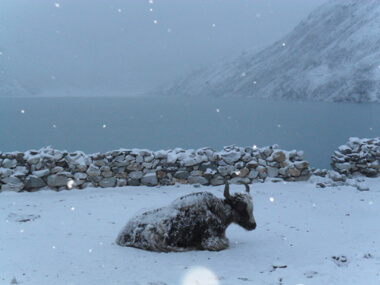 There are two beautiful lakes at Gokyo and it was once more popular as a Yak pasture. This region is amazingly beautiful as it houses few mountains such as Cho Oyu, Everest, Lhotse and Makalu. These mountains are clearly visible from Gokyo Ri above Gokyo lake. The ice ridge between Cho Oyu and Gyanchujgang is remarkable sight in the Khumbu region. After the trek is over, we return back to Lukla to catch a flight back to Kathmandu. 01. Transportations from Airport – Hotel – Airport, by Air-Conditioned Car, Van, Heice. 02. English Speaking experienced Sherpa, Govt. Trained/Licensed Holder guide. 03 Personal insurance for Nepalese staffs. 04. One Sherpa,(guide assistance) group size more than 4 pax. 05. Sagarmath National Park fee, TIMS permits & Any required permits or Official Documentation. 08. Meal cost 26-30 US Dollars per head each day for the whole trek. And the meal consists of Breakfast, Lunch, Dinner, Tea or Coffee. 09. Welcome dinner with Live Nepalese Cultural Program. 11. Private Transportation, by Air-Conditioned Car Van, haice and Coaster for Sight seeing in Kathmandu as per our itinerary. 12. Guided sightseeing around Kathmandu Valley with all applicable entrance fees as per our itinerary. 13. Dessert: Fresh fruits seasonal, Orange, Apple, Banana and Tin fruits. 14. Energy-supply chocolates: Snicker, Mars, Twix and Boundary. 15. Biscuit and Tang Juice, Hot Shower, Excess baggage charges. 05. Personal expenses, what are not mentioned in above services? Boudhanath is a huge Buddhist stupa located about 7 km east of Thamel. It stands on a massive mandala style platform and has features similar to the Swayambhunath, though it is bigger than Swayambhunath in size. It is said that this stupa was built during the 5th Century. Every year, Thousands of pilgrims from Nepal and neighboring countries visit Boudhanath, particularly in winter and Pashupatinath temple. Pashupatinath temple is one of the biggest Hindu temples. Overnight stay at Hotel. Fly from Kathmandu to Lukla where the trek starts. Initially the trail descends steadily along the banks of the Dudh Koshi River , passing Sherpa villages and Mani stones before reaching Phakding for an Overnight stay at guesthouse. Namche is tucked away between two ridges amidst the giant peaks of the Khumbu and has an abundance of lodges, tea shops and souvenir shops. It is an ideal place to spend a day, acclimatizing to the new altitude before heading off towards Tengboche. To acclimatize, you visit Khunde Hospital set-up by Sir Edmund Hillary, or take a one hour walk up to the Everest View Hotel above Namche for the sunset view of Ama Dablam, Nuptse, Lhotse and Everest. There are also good views from the National Park Centre and Museum just above the town Overnight stay at guesthouse. To acclimatize smoothly, we just make a two hours walk to Khumjung, after a visit to the Sherpa culture + Everest conquest museum of Namche Bazar . Khumjung is a very old Sherpa village, with two monasteries, where Sir Edmund Hillary, first climber of Mount Everest in 1953 with Tenzing Norgay Sherpa, created a school and a hospital (Kunde). Afternoon is the time for rest at camp or lodge . Overnight stay at guesthouse. Facing us, Ama Dablam, 22,499 feet, one of the most beautiful peaks of the world, with Matter horn and Alpamayo (South America). Our footpath goes through the slopes climbing to Khumbila, and reaches our first pass, Mon La, 13,035 feet. Steep descends to Phortse Drangka. We leave the valley going to Everest trail; we are now in Gokyo valley. Just at the limit of the tree-line, we reach the mountain pasture of Dole. Overnight stay at guesthouse. The trail starts today by climbing steeply through scrub junipers to a single lodge at Lhabarma (4330m). We pass the small settlement of Luza (4340m) and continue to climb along the side of the valley, high above the river to Machhermo. It was here that a yeti supposedly killed three yaks and attacked a Sherpa woman. This is the most credible yeti incident ever reported, so be watchful as we visit this region. Overnight stay at guesthouse. Gokyo Lakes, which draw many hinduist pilgrims, will be reached today. Passing through the small hamlet of Pangkhat, the trail offers a superb view of Cho Oyu, 26,715 feet, on the Tibet border. After a 3 hours walk, the footpath goes along the three Lakes of Gokyo: Longpongo, Taoche, Dudh Pokhari, standing in the center of a splendid mountains' circus. We take rest at the camp in the evening. Overnight stay at guesthouse. Start walking towards the base of Gokyo Ri before breakfast. Climb to the top of Gokyo Ri (5483m), the only trekking peak in Khumbu region. You will not need any special climbing gears to do so. You are likely to be overwhelmed by the superb views of Mt. Everest , the massive Ngozumpa Glacier and the whole of Khumbu Himalayan Range including Mt. Lhotse , Mt. Nutse , Mt. Makalu (8481m), Mt. Cho-Oyu (8153m) and Mt. Gychung Kang (7922m). If there is enough time, you can take a walk around Gokyo Lake returning to your accommodation in Gokyo. Overnight stay at guesthouse. 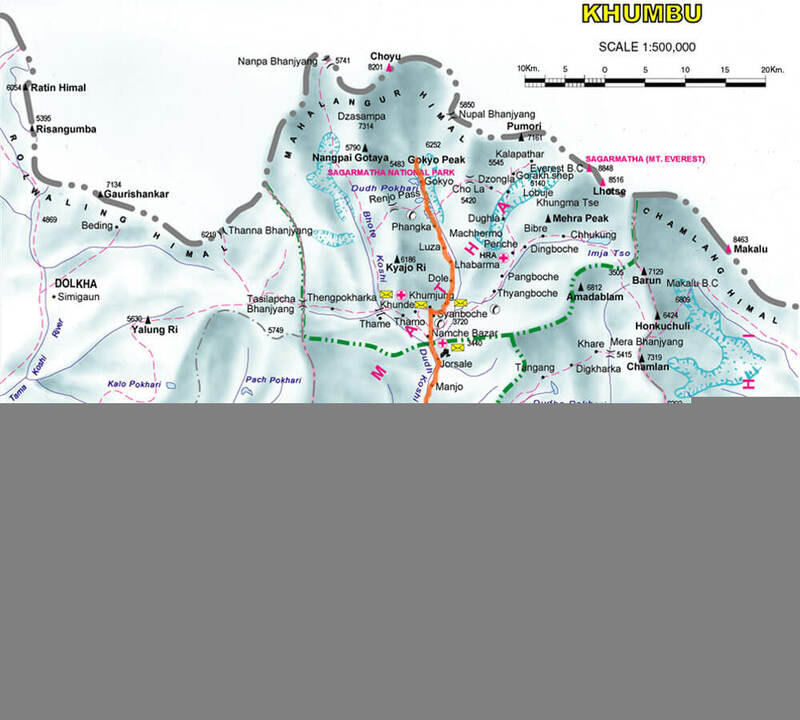 From today you will be trekking in the opposite direction, and the first stopover will be made at Dole. Overnight stay at guesthouse. After walking for about 6 hours, you will arrive at Namche Bazaar. Overnight stay at guesthouse. Trek from Namche Bazaar to Phakding (2652m.) and it takes about four hours. The trails descend steeply for early one and half hours. After that, the path has small ups and down to Phakding through Monjo. Overnight stay at guesthouse. Trek from Phakding to Lukla [2886m] and it takes about three hours. Your final day's trekking follows the Dudh Kosi back down to Lukla. The trail then continues back towards Lukla, where we will reconfirm our flight tickets for the next day and spend the night. This last evening in the mountains is the ideal opportunity for a farewell party with the sherpa guides and porters, where you can sample some chhang (A kind of local alcohol), try Sherpa dancing and look back on a memorable trekking experience and staffs are expecting for precious Tips. Overnight stay at guesthouse. After breakfast, our city guide reaches in Hotel with Vehicles, and then we drive to Bhaktapur Durbar Square . Bhaktapur is one of the oldest cities in Kathmandu valley. It is well known as Living Museum . Old brick paved enclave of old Royal palace, Nyathapola Temple , Datatriya temple, exquisite artwork offers a picture of the grandeur of medieval Nepal . And Patan is located 7 km away from Kathmandu , this city has many 15th to 17th century, Hindu and Buddhist, monuments built during the Malla dynasty. The most important area with many monuments is the Patan Durbar Square . We stay overnight at hotel.